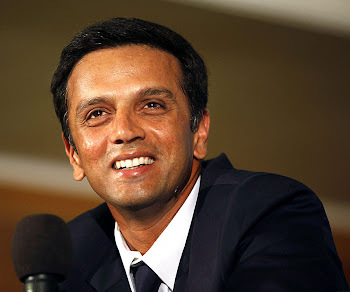 Rahul Dravid: We will miss you Jumbo! We will miss you Jumbo! heartbreaking to watch his career ending with under-performance (that is what a few big names in cricket world called it).Anyways, that is how it has ended. wicket.Remember his 100% diving efforts to take a catch (he used to forget his age at that time).Remember his devotion with which he used to keep bowling longer spells.And remember a big smile on his face after getting valuable wickets that could turn the course of the game. We are going to miss it now.It will take some time for every Indian to come out of this shocking news.There won't be any "----caught Dravid b Kumble","----lbw b Kumble" in daily newspapers. In all, we will miss him a lot.Hats off to you, Jumbo!!! Rahul Dravid:"He is an extraordinary man with extraordinary career. It's been a privilege to play with him,"
"It was emotional for all of us but it's a great time to celebrate the farewell of one of India's greatest cricketers," he added. In 2005, Rahul had given a tribute to this legend.Read it here. Sachin Tendulkar:"It's truly an honour and privilege to have played in the same era. He will remain an inspiration for the next generations. To become another Anil Kumble one will have to work really, really hard,"
Sachin recalled a match in Antigua when Kumble came into the match with his jaw in bandage and got Brian Lara out. "This is one match I can't forget," he said to emphasise that Kumble had a "big heart". "He is one sportsperson who has a big heart". "I have not come across a greater cricketer, who is good so dedicated to his work," he added.